It is hard to believe that there are only six months remaining in 2012 and yet here we stand at the midway point, making the necessary preparations to launch ourselves forward at an ever increasing velocity towards the close of this momentous year. Children of the Sun Foundation would like to share recent insights while clarifying the collective goals we would like to attain. It is only through a clear, unified focus that will ensure the successful fulfillment of our final initiatives for 2012. Through a deeper and more simplistic elucidation of these ideas, we can rise together to the same levels of comprehension, thereby assisting in our unwavering focus. This holistic integration of our intuitively acquired knowledge will then serve to catalyze the necessary momentum to create our Rites of Passage into pure Christ Consciousness, taking our fifth initiation as one Group Avatar. These Rites, available to all, will commence on the September Equinox and will continue for 12 consecutive weeks with one Rite per week. During this time, each of us will be called upon to surrender all that is left of our individual self unto the Ascension Flame as we are completely emptied in readiness for monadic absorption. The Planetary Grid Project is COMPLETE! According to the Ascended Masters overseeing the activities of Children of the Sun Foundation and its platform of Planetary Light Servers, one of the most predominant phases of our Divine Mission is now victoriously accomplished. The activation of the planetary Crystalline Grid is now fully complete to the appropriate levels that we and the Councils of Light were intending in relationship to its ability to support the Earth dimensional frequency shift and the advancement of the human race. Through our demonstrated levels of unity, which extends outwardly to include all other Light Server groupings assisting in this planetary focus, we have successfully activated the new consciousness grid matrix to support our full entry into 5th dimensional conscious living. What a tremendous feat and accomplishment, especially during these last five years as we have joined together every new and full moon, without fail, in service to the greater whole. The vast potential of this crystalline matrix is infinite... continuing to expand and evolve as with our own consciousness. To support our accelerating momentum, the Planetary Grid Transmissions will continue five more times and until the new moon, September 16, 2012. We will then transition into a weekly grid transmission focus for 12 straight weeks, beginning with the September Equinox and until the December Solstice. 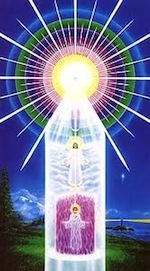 Our final and most sacred step in this preparatory focus is to advance as many Planetary Light Servers as possible into the full actualization and embodiment of Christ Consciousness. The final torch of Sacred Fire is then to be carried in our hearts as our collective group radiates out to reach and transform the multitude. 1. Our final preparations into Christ Consciousness as a collective grouping. 2. Then, our walk together, arm in arm, out into the world, bringing the messages of hope and illumination to uplift the people of the world. Only as One can we truly be the Christ Avatar. Throughout the duration of our evolution as Planetary Light Servers, we have predominantly identified with the individualized aspect of our mighty I AM Presence. This personal connection to our God Self has provided us with a rudimentary understanding of how incredibly all encompassing the Divine Consciousness of God truly is. As we prepare to experience more expanded levels of Unity Consciousness, we are now taking our focus off of the individualized I AM Presence and placing our attention solely upon the GROUP I AM, the one body of God Consciousness. In this infinite field of creative energy, every I AM Presence belonging to every person on Earth is one and the same. The individualized I AM Presence as an outer and more supreme individual energy hovering above us has, in a sense, been a type of applied illusion in order to raise us to new levels of understanding. According to the Ascended Master Saint Germain, the use and portrayal of the term, the mighty I AM Presence as an "individualized, higher consciousness", was actually a stepped process to transition us into Unity Consciousness. The perception of the I AM Presence has been skewed in many of our applications... as not being first embraced as a group consciousness living inside each of us. At the time this worded application was introduced, we were not capable of understanding the idea of group mind or the letting go of our personal identities. The I AM Presence shares the same meaning as the term 'Monadic Source'. This is a direct aspect of the God-force, or the God-Self, containing all individualized, multidimensional expressions of the self. Our Monadic I AM Presence comprises many souls. Our human personality and our soul are individualized aspects of a group of souls and even a group of Monads. The Monad is also another term for the Group Avatar, the Group I AM. Every person in an earthly embodiment has an individualized soul. In our advancement into the Christ Consciousness, the soul goes through a process known as monadic absorption, this being absorption by the Group I AM Presence. This is the process by which the soul, through the light-bridge of the antahkarana, is by-passed as the personality comes into contact with, and under permanent service to the Monad. The soul becomes redundant and is fully absorbed by the Monad. Our personality becomes a direct instrument of service under the direction of our God Self. As the highest divine aspect of our multidimensional constitution, the I AM Presence is a vast group consciousness. 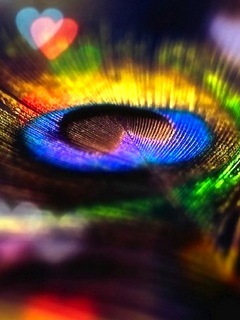 Through our enlightened personality vehicle, it hears, sees, thinks, feels and responds to only Perfection. As we consistently give adoration, feel gratitude and qualify our every activity with and through the Group I AM Consciousness, our daily positive impact upon life is immeasurable. We are greatly encouraged to re-write, re-chart and re-diagram all text and images which indicates the I AM Presence and the holy Christ Self as individualized expressions outside of the human body, or as a separate consciousness not inclusive to the group integrity. In truth, higher and lower are concepts based in duality. All is one and all is within. We give our deepest love and gratitude to the artists of these images which have greatly served to raise our understanding of the Great God Self. These images, however, no longer apply to our one group emergence. The I AM Presence is Group Consciousness. The I AM Presence is not higher or more supreme. It is not outside of the body. We are God in form. words, see the COS Glossary. 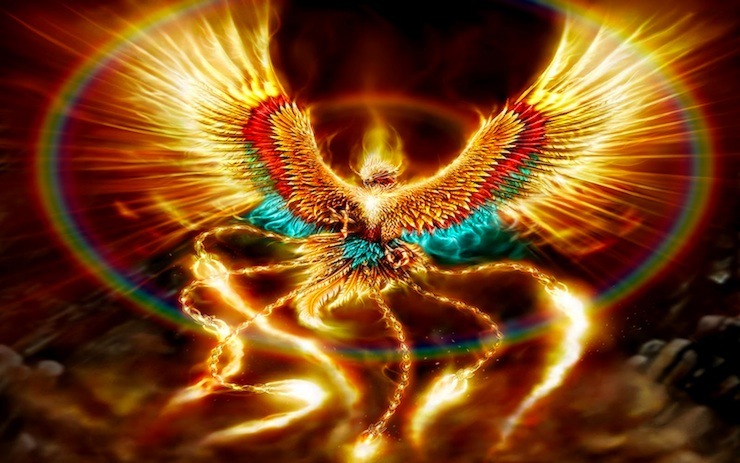 The I AM Race is a God Race of Divine-Humans who have successfully endured the fifth and final initiation of physical plane mastery, otherwise known as The Resurrection. Resurrection is the ultimate goal for all Humanity. This grand culmination of the human experience is the rising up out of matter and into a spiritualized fifth dimensional consciousness perception. Essentially this means that eventually, all people residing upon the New Earth body will be Divine-Humans and liberated Masters. Together we will serve in absolute harmony with the cosmic Councils of Light overseeing Earth's evolution as we achieve heightened levels of energetic sensitivity and awareness. There have been a lot of diverse opinions and feelings surrounding the word 'ascension' and how it applies to the planetary shift. Everyone seems to hold a particular belief, one of which includes ascending off the planet into another dimension. Children of the Sun Foundation would like to clarify the use of the word, ASCENSION and how it relates to our specific mission and the evolution of our Group Avatar. In this grand shift of our consciousness to another and much more expanded lens of perception, most of us are not ascending off the planet. While we may be "ascending" our frequencies, words such as emerging and revealing may more appropriately describe our current process of transfiguration into the Divine-Human expression. This may prevent any misunderstandings as we now prepare to take our messages to the multitude of mass consciousness. It is imperative to understand that we are not ascending to meet the God Self, nor does the God Self descend into us. The God Self is right here with us and has never ever left our human form. Once we are pure and clear, the God Self simply emerges as the Christ Light pouring out from the awakened heart and from a greatly expanded three-fold flame of Divine Love, Divine Wisdom and Divine Power. Christ Consciousness is a state of consciousness that we actualize once our personality body is completely surrendered to Divine Will... it does not descend, rather, it reveals. 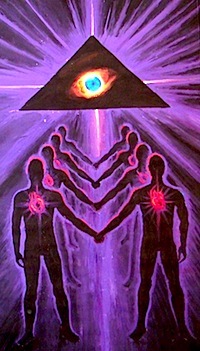 Christ Consciousness is Unity Consciousness! To continue seeing our Christ Self as being outside of us, to see our I Am Presence as higher or lower... keeps us in separation. Every particle of creation is centered here and now, bound together through the magnetic power of Divine Love. The reason why we see two bodies, or higher expressions and lower expressions is because we do not know ourselves as God. We are still separated. Once we know ourselves as God, God emerges. Whenever we think of God, we ARE God. Energy follows thought. What we think, we become. Christ Consciousness is a "frequency" of consciousness. As we undergo the required initiations and renunciations, our vibratory frequency increases to a level of resonance which resides in another perceptual awareness. This is what we are referring to as the "dimensional shift". This shift is based on a change of perception that is in absolute acceptance to the divinity in all things (also known as God Realization or God Union). This level of evolved consciousness does not judge, does not criticize, coerce, tempt, it does not condone, and neither does it react negatively. In its simplest form, vibration is the rate of oscillation around an equilibrium position. At a spiritual level, vibration is the rate of spin of the electrons as they move around the nucleus of the atom. To increase this rate, we must have more light within our cells. This is why we are focusing on "Building our Light Quotient". 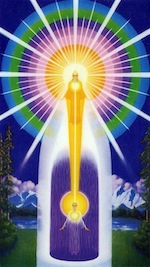 As our vibration increases, the Christ light emerges to fully illuminate our physical vehicle. Christ Consciousness is Pure Love from a Group Harmonic! Our journey of awakening and its unique experiences have never ever been about the individual self. All that we have and are enduring has to do with the necessary requirements to further the Group Plan in order to help the human race evolve. In this grand synthesis process now occurring, our individuality, as we have lived it, is rapidly dissolving. As we come closer to actualizing Christ Consciousness, which is pure love from the group harmonic, we are placing less emphasis on the need for acknowledgement as an individual self expression. 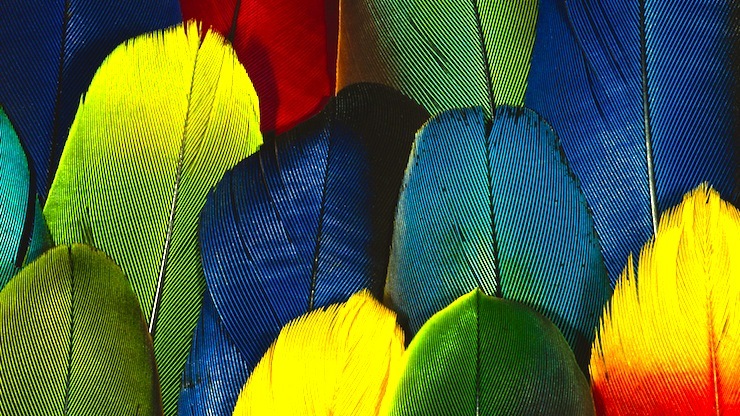 We find that individuality is another illusion, a minuscule reflection of our inclusivity within another more expansive umbrella field of energy. In essence, we are a conglomerate of the many monadic energies and aspects that comprise our soul family tree of life. Our personalities are not real. Our emotions, our minds, our bodies and our etheric natures are not real, merely instruments that are constantly changing. The only true, lasting substance is that part of our consciousness that pristinely vibrates to an all encompassing group tone. Once we fully realize this, we are able to experience complete detachment from the pull of matter and duality consciousness. Keep the focus solely on God. Put God everywhere... before all, within all, around all, enveloping all, enfolding all. God is our focus point upon which every thought and act is centered as this brings forth the Divine-Human Self. We have one objective to accomplish which is to have our will in complete focus with the Will of God, the pure mirror of our thought-force. When our desires are set forth in this way, it is always Divine. With our divinity always projected, our desire is conceived in Divine Order. We will conclude this focus with a final reminder that we must let God stand forth through us into full outer expression. It is no longer necessary to seek the Divine through any outside sources. When we know that the source of all love, the spirit of all wisdom and the understanding of all truth is within us, we can tangibly experience the Divine Remembrance of our infinitely powerful God Self in physical form. By placing our focus upon God within and seeing God standing from us, inside out... we are placing our focus upon the Supreme Deity in the whole human family! To place our attention upon anything outside of that or to give our power over to outside sources is to maintain separative action. The new emanation is the one life that is in all and through all. Whenever we think of God, we ARE God.